Brenda graduated from the Lauterstein-Conway Massage School in Austin, Texas in 2013 and earned a Bachelor of Science from the University of Minnesota in 1988. She has completed over 200 additional hours of training including Manual Lymph Drainage, Deep Massage the Lauterstein Method, Zero Balancing I & II, Acupressure, Hot Stone, Aromatherapy and Thai Massage. Brenda recently completed Tracy Walton’s Oncology Massage Therapy: Caring for Clients with Cancer workshop. She currently provides hand and foot massage to patients at Texas Oncology Round Rock. Brenda has been a faculty member at the Lauterstein-Conway Massage School since 2013. She was certified as a Massage Therapist Instructor in 2015. 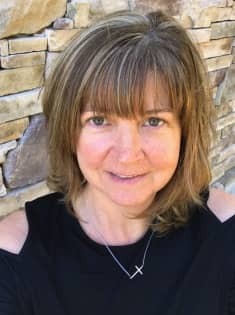 In her private practice, Bianchi Therapeutic Massage, Brenda strives to integrate the right combination of therapies to accommodate her clients’ needs and desires. Professional memberships include Associated Bodywork and Massage Professionals and Oncology Massage Alliance. Brenda is married and has been blessed with two sons. When she is not cheering for her teenage boys during their various athletic and academic events, she enjoys playing tennis, yoga, photography, scrapbooking, reading and spending time with her husband and their dog, Lucky.